In small town suburbia, three young men are ready to make their mark. Solomon is all charisma, authority and charm, down for the moment but surely not out. His half-brother, Jimmy, bounces along in his wake, underestimated, waiting for his chance to announce himself. Aleks, their childhood friend, loves his mates, his family and his homeland, and would do anything for them. The question is, does he know where to draw the line? Solomon, Jimmy and Aleks: way out on the fringe of Australia, looking for a way in. Hip hop and graffiti give them a voice. Booze, women and violence pass the time while they wait for their chance. Under the oppressive summer sun, their town has turned tinder-dry. All it’ll take is a spark. As the surrounding hills roar with flames, the change storms in. But it’s not what they were waiting for. It never is. He is the former winner of the Australian Poetry Slam and the Indian Ocean Poetry Slam. He has released four hip hop records, three poetry books (including Parang and Millefiori), appeared on ABC’s Q&A and received a standing ovation at TEDx Sydney at the Sydney Opera House. 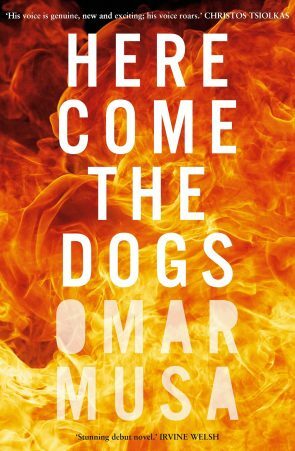 His debut novel Here Come the Dogs was published by Penguin Australia in 2014 and was longlisted for the International Dublin Literary Award and Miles Franklin Award. Musa was named one of the Sydney Morning Herald’s Young Novelists of the Year in 2015.